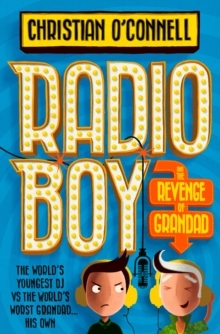 Debut sensation Christian O’Connell is back with more hilarious adventures of Spike, super-star radio DJ… and trouble-prone ordinary kid. The World’s youngest DJ is still the talk of the town. A town that’s about to turn against him. Radio Boy and his team, Artie and Holly, are back and continue to broadcast live to the world from Spike’s garden shed. Then, following a shock split from Nan, Grandad Ray comes to stay. Spike decides to cheer him up by inviting him onto the show. He becomes an instant hit with the listeners and Spike keeps him on as a new team member. But things get really awkward when Spike realises Grandad Ray only has three stories and keeps telling them over and over again.